Long before it was one of the premier restaurants in Salem, the property on Church Street belonged to Bridget Bishop. Bridget was born in England but came to Salem in 1660 with her first husband. After her husband died a few years later Bridget remarried Thomas Oliver, a wealthy widower. Unfortunately this relationship wasn’t very healthy and the couple quickly developed a reputation after several squabbles got out of hand and the law enforcement had to get involved. When Oliver died in 1679 Bridget inherited all of his wealth and property. This didn’t sit well with Oliver’s son who only received a small amount of money. Word quickly spread around Salem that Bridget had cast a spell on Olvier and killed him so she could inherit his wealth. Due to her reputation of being loud and violent many around town avoided her and considered Bridget to be bad news. So when the Salem Witch Trials began in 1692 it was not a shock when five young women named her as a witch. Others came forward and told stories of Bridget and her outlandish behavior around Salem. She was convicted of being a witch and sentenced to be hanged. Bridget was executed at Proctor’s Ledge and buried on site. With her death Bridget ushered in the Salem Witch Trials and was the first to be executed and put to death for being a witch. The land Bridget owned originally contained an apple orchard and a small home. After her death it was seized by the sheriff and divided up among the village. In 1831 Lyceum Hall was built on the property. It was a small auditorium where lectures and debates were held. Daniel Webster, Edgar Allan Poe, Ralph Waldo Emerson and other notable men from the 19th century spoke here. On Feb. 12, 1877 Alexander Graham Bell made the very first long distance phone call at a demonstration at the Lyceum. Bell called his assistant, Thomas A. Watson at the Boston Globe. In the early 20th century the Lyceum burned down and was replaced by a brick structure that became home to the Lyceum Bar and Grill in 1971. Several restaurants came and went over the years. 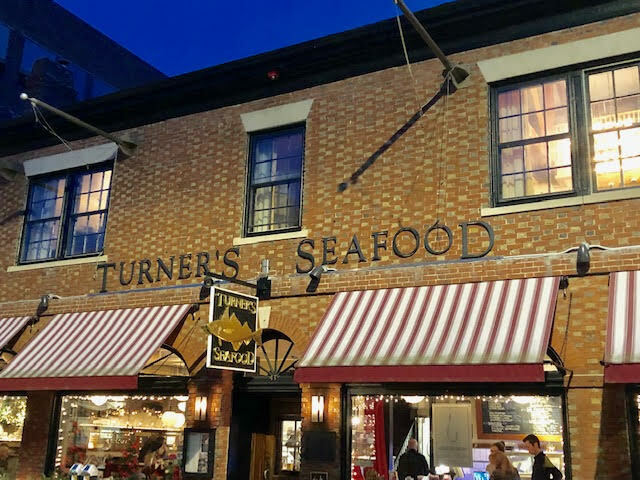 Today Turner Seafood occupies the building. Ever since the 1970s people that have visited the building have claimed to see ghost of a woman in a white dress. The ghost has been spotted in various places around the building but seems to like the second floor as well as the staircase. It’s thought that the spirit is Bridget Bishop who wants to watch over her property. In addition to the apparition, guests and former employees tell stories of seeing the reflection of a woman in mirrors in the restaurant. Doors have been known to open and close on their own and lights turn themselves off and on for no reason. But the strangest occurrence happens late at night when the restaurant has shut down. Employees claim they can smell apples in various parts of the building when all the guests have left for the night. Lyceum Hall has been the subject of numerous reality ghost hunting shows over the years such as Ghost Hunters and Ghost Adventures. For more info on Lyceum Hall and other haunted places check out the Salem Ghost Map in iTunes for only $1.99.